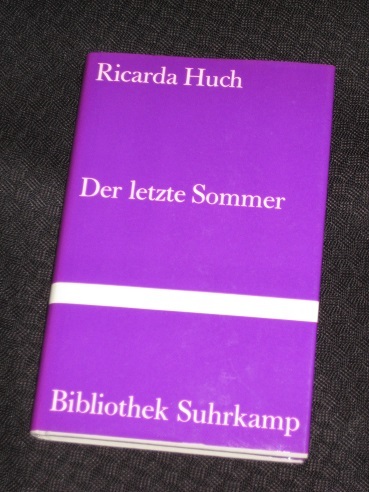 Ricarda Huch’s Der letzte Sommer (the English version, The Last Summer, was translated by Jamie Bulloch for Peirene Press) is an epistolary novel set in Russia in 1905. The first letter of the book (the first of many…) is from a young man called Lju to his friend Konstantin, describing the family he will be spending a summer with in the Russian countryside. In his wry manner, Lju discusses his new employer, Governor Jegor von Kasimkara, and his wife Lusinja, before adding details about the Governor’s son, Welja, and his two daughters, Jessika and Katja. …aber ich kenne die menschliche Seele gut genug, um zu wissen, daß diesem Wesen maßloser Hochmut zugrunde liegt. Haß, ja selbst Übelwollen setzt doch eine gewisse Nähe zu den Menschen voraus; diese fühlen sich im Grunde allein in einer ihnen gehörenden Welt. …but I know the human soul well enough to know that this state is built upon unfathomable depths of pride. Hate, even dislike, requires a certain closeness to people; in truth, these folk consider themselves alone in a world that belongs to them. Epistolary novels can be a bit hit and miss, but Huch, a classic writer little known in the Anglosphere, pulls it off beautifully. Der letzte Sommer is largely constructed from the writings of five characters, Lju and the members of the Governor’s family (interestingly enough, Jegor himself largely stays silent). Each writer has their own distinctive style, from Lju’s wry, psychological musings to Lusinja’s perplexed, lengthy monologues and Katja’s childish letters to her aunt and cousin. With the reader not privy to the replies of the recipients outside the immediate theatre of events, there’s a danger of the story becoming a little repetitive, but Huch cleverly has the children making short trips to their aunt’s house in Saint Petersburg, which allows several of the main characters to speak to one other. Huch’s work is a short novel with a distinct idea at its core. Lju has three months to ingratiate himself and fulfil the task he has committed himself to, namely assassinating the Governor. Initially, he’s very clear in what is expected of him and forthright in his disdain of the man he has come to kill. Yet the longer he stays in his house, the more he grows to respect him, and when writing to Konstantin, he acknowledges the man’s strengths, wondering if it might be possible to persuade his employer (and host) to reverse his decision to imprison certain student activists (the reason for this ‘death sentence’). Unfortunately, the Governor’s qualities mean that despite his genial nature, this is the one thing he can’t – and won’t – do. In fact, as the summer wears on, the suspicion grows that Lju is finding his task far harder than he admits. Thrown together with the family on a daily basis, his relationship with them grows ever stronger (especially with the girls), a sort of Stockholm Syndrome in reverse. This is just as true of the family as of Lju, though, with the initial reserve towards the young stranger giving way to respect, and more. Part of the charm of Die letzte Sommer is the interplay between the characters (even if we don’t see it), with a variety of voices describing the same events from slightly different perspectives. Lju is confident in his ability to hide his character and emotions, but from other letters, we see he’s not quite as opaque as he might believe, with cracks in his facade appearing the closer he gets to the other characters. For large parts of the story, it’s actually a rather light-hearted tale, at times becoming an Austenesque farce turning on misunderstood intentions (and Lusinja’s frantic obsession with what she believes is Lju’s tendency to sleepwalk). In many ways, it’s less a thriller than a novel of manners, with Lju’s arrival allowing everyone to see themselves, and others, in a new light. Lju himself recognises the older man’s qualities, while detesting his politics, and part of the difficulty he faces during his extended visit comes from the recognition that those who wish to sweep away the old guard have little of their charm or character. The young visitor knows he’s on the right side of history, but there are occasions when he’s tempted to just leave things as they are. Time rarely stands still, though, as slowly as it might seem to pass on occasion, and the clock begins to tick more loudly the closer we get to the end of summer. Lju has a job to do – can he bring himself to do it? In this way, while very different in style, the period and plot are reminiscent of an excellent Russian novel, Andrei Bely’s Petersburg. Huch’s work is very similar in revolving around a main character who has volunteered to ‘take care of’ a high official, but also in the way he has second thoughts (and even in the method chosen for the deed…). I really liked this one – and it has quite a modern feel to it, despite its epistolary nature. Yes, the way they acted yes, But the pull between ideology and personal commitments felt quite fresh – or perhaps it is ever-present. Ok you sold me. Ordering now! I thoroughly enjoyed this – very cleverly written and I loved the ending. You have the advantage of being able to read more of her work. I think there may be some older translations but not easily available! Much later I read Huch’s Bakunin biography and finally understood why Huch caught the atmosphere and characters so well and credible; she had done a lot of historical research on the subject.